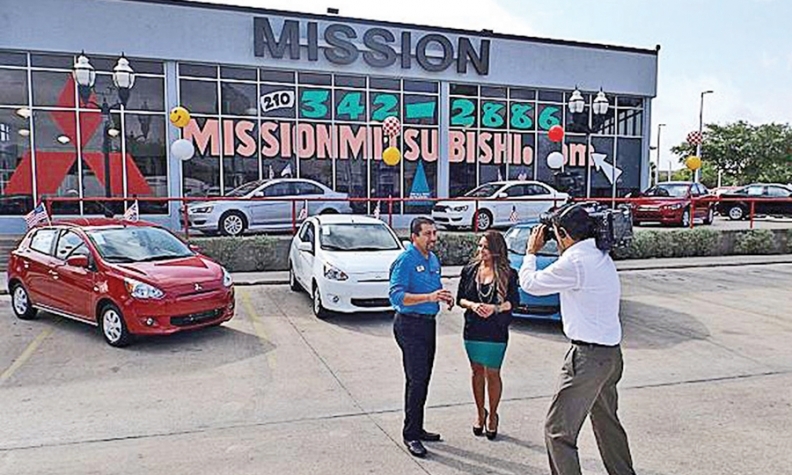 Mission Mitsubishi is featured in a daily segment on a Spanish-language TV channel. Mitsubishi says Mission is now its largest-volume store in the U.S.
Mission Mitsubishi of San Antonio was selling barely 30 new and used vehicles a month and on the verge of bankruptcy in 2011. Then its new owners embraced marketing to Hispanics. Now, Mission is the largest-volume Mitsubishi store in the United States, according to the automaker, selling more than 230 new vehicles a month -- and begging Mitsubishi for more inventory. New owner Islam Hindash and his two investment partners entered the failing store in 2011 with a commitment to spend $100,000 a month on advertising. But it was a local TV advertising rep who lit the fire when he urged Hindash to spend some of that money on a local Spanish-language morning news program. The salesman pointed out that 63 percent of San Antonio's population is Hispanic. And no other local car dealers were advertising on the Spanish-language channel at that moment. Hindash signed up for a daily 10-minute morning spot in which a featured store employee discusses some part of the dealership -- the service department one day, a new model's arrival the next day, a financing package the next. The spots are all-Spanish, with Hindash's Spanish-speaking employees on camera. "Customers come in wanting to meet the person they saw on TV," Hindash says. "That's who they specifically want to do business with. "It's become a great environment of referrals and repeat business," he says. "The Hispanic culture is very family-oriented by nature. Family members recommend other family members. And it's not unusual for us to have entire families come in together to discuss a car purchase. Sometimes, we'll end up selling a second car right there as we go through the sales process." Hindash has added more Spanish-speaking employees, including sales personnel, service advisers, finance managers and others. In the past few months, he has doubled his advertising budget to $200,000 a month to increase his presence in other Spanish-language media.